The EIB 741 is an external interface box for precise position measurement. It is ideal for inspection stations and multipoint inspection equipment as well as for mobile data aquisition, such as in machine inspection and calibration. It features an ethernet connection and provision for connecting up to four encoders. The MSE 1000 is a modular unit for multi-point inspection applications. Individual modules permit the connection of incremental, absolute, and analog signal inputs, digital switch outputs. The unit communicates with a host PC or PLC using a standard 10/100	ethernet connection. Up to 250 measuring channels can be configured using a single ethernet connection. The PROFIBUS gateway is used to interface EnDat encoders to a PROFIBUS-DP network. 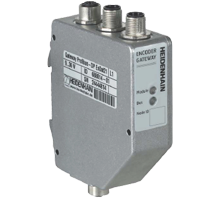 HEIDENHAIN interface adaptors are used to adapt the encoder signals to the interface of the subsequent electronics. They are used when the subsequent electronics cannon directly process the output signals of the encoder, or if additional signal interpolation is required.